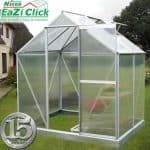 The 8′ x 6′ Nison EaZi-Click Polycarbonate Greenhouse is a very attractive, practical and well made greenhouse that you are going to get many, many years out of. This is an ideal size and offers you plenty of room to grow and look after some plants. Or you may want to start growing your own vegetables and wow your friends and family with some delicious tomatoes. Due to the floor space and the very generous amount of headroom, walking around and spending hours in here is going to be very comfortable and if you start to get a little bit too hot then you can always open up the vent on the roof. Speaking of the roof its apex design along with the included guttering system is going to keep the inside of the greenhouse nice and dry even when it is hammering down with rain. 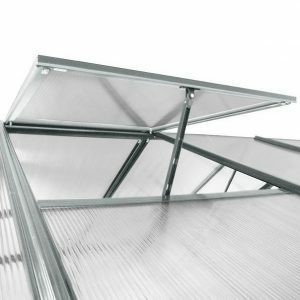 Rather than use glass which can easily be smashed, the walls of this greenhouse are made with very high quality, 4 mm thick polycarbonate panels. These are kept together with a strong and rust resistant, anodised aluminium frame which easily clicks together thanks to the impressive, EaZi-Click system. 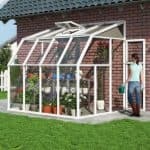 This is one very well designed greenhouse that is going to last you for a many years and give you your own little space to potter around in and forget about the outside world. The smart looking and easy to install, 8′ x 6′ Nison EaZi-Click Polycarbonate Greenhouse will provide you with all the space you need to make sure plants are well protected from harmful UV rays and your prized tomatoes are kept safe from squirrels and other things that may want them as a cheeky snack. 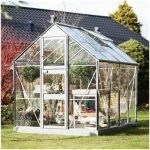 This is a very good sized greenhouse and truth be told, you really do not need a large garden to install this. The depth is 8 feet 4 inches and the width is 6 feet 3 inches so you have more than enough room to keep many rows of plants and food safe and well looked after. The headroom available in here is great as along the ridge it stands at 6 feet 11, you can walk around comfortably and also have things stacked quite high. The eaves height is 4 feet 11 which we know may sound low, but this is exactly what we would have expected and we are more than pleased with the eaves height. The roof is an apex style roof made from polycarbonate panels on a anodised aluminium frame, which will always make sure the rain will run off, but also this greenhouse has a very well designed guttering system that is really going to make sure no water is getting inside. We love this added guttering and it was a very pleasant surprise to find out it was on here. The walls of this greenhouse are made with polycarbonate panels these are 4 mm thick and they will offer just the ideal amount of insulation all the while keeping those destructive UV rays at bay. It is also far more safe than glass, especially if you have kids who like to play in the garden. 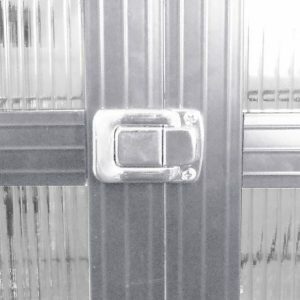 The frame is very impressive and is made with anodised aluminium now we know this to some may sound like something that was used to build the Starship Enterprise, but this kind of aluminium will not rust and it is also very strong. It makes this one very secure structure and because of the EaZi-Click technology it all clicks into place very easily. As you can see from the pictures there is no flooring included with this greenhouse. The idea is that you will place it on the grass, decking or concrete in your garden. There is a strong and thick framing around the bottom which you can clearly see, we really like this as it helps make this a more robust structure. One of the best things about the 8′ x 6′ Nison EaZi-Click Polycarbonate Greenhouse is those high quality, polycarbonate panels require very little upkeep. You may want to give them a clean every now and again, but that is easily done with a blast from the garden hose. Due to the EaZi-Click system, you could even take panels of if you wanted to give them a real thorough cleaning. 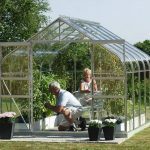 Due to the rust free nature of the anodised aluminium framing and the overall design of this greenhouse, Nison are giving you a very generous 15 year guarantee with this. There is a large, just under 6 foot high sliding door located on the front of the greenhouse. This sliding door is made using the same anodised aluminium framing and polycarbonate as the rest of the greenhouse and we really like it. Not only does it look cool sliding back and forth it also securely closes so that no rain, animals or even more importantly, kids can easily get inside. How can you talk about windows on a greenhouse isn’t it just like one giant window? Is something we are sure you are thinking right now, but this greenhouse does have a surprise up its sleeve in the form of its opening window or if you want to be exact the, opening roof vent that is on the roof. This is a panel which can be opened to let in some fresh air, which if you are working hard in here on a summer’s day you will be very thankful for. With the roof vent closed and the door slid properly shut, you are going to be amazed at how secure and watertight this greenhouse is. As all the walls are made with that fantastic 4 mm thick polycarbonate there is no privacy at all with this greenhouse. Just be sure to hide some of your more prized plants and veggies behind other things if you do not want people to see them. There is not really anything you can do to customise the look of this, but we are sure those of you with green thumbs will have a very fun time organising everything inside here. Of if you wanted to do something to the outside, a sign hanging on the door warning the kids or grandkids that this is a football free zone would be a good idea. 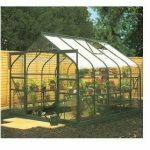 There are a couple of extras that you may be interested in available with this greenhouse. If you love the sound of that vent on the roof then you can actually add another one for a cost of £49.99. This is something that is worth considering if you do plan on spending a lot of time pottering around in here as it can get hot. We love the EaZi-Click system, but 10 or 20 years down the line those clips may start to wear out or even snap, well do not worry as they sell a pack of 24 extra EaZi-Click Greenhouse Clips at a fair price of £12.99. It might be a good idea to buy a pack of these when you order the greenhouse and just thrown them in a drawer for use in the future. 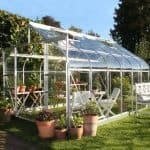 This is one very impressive greenhouse and we love the use of polycarbonate panels and the anodised aluminium framing as it makes it strong, but also does not make it cost a fortune. You get a 15 year guarantee with this and we can see this lasting easily double that. Replacement EaZi-Click clips can be bought for a low price and installed easily if you need them many years down the line. While not the largest structure, we feel that there is more than enough room in here to have fun looking after plants, growing your own food and also using it as a place to hide from the other half when you are in the bad books. The EaZi-Click system really does make putting this together rather easy. Just make sure you have a friend to help you due to the height and you will have this built in no time at all. 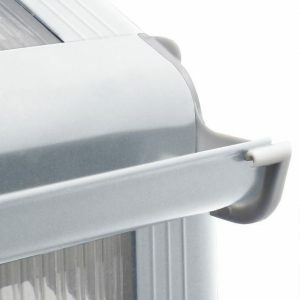 We feel that this is very good value for money due to the way it is designed and because of how many years use you are going to get out of it. 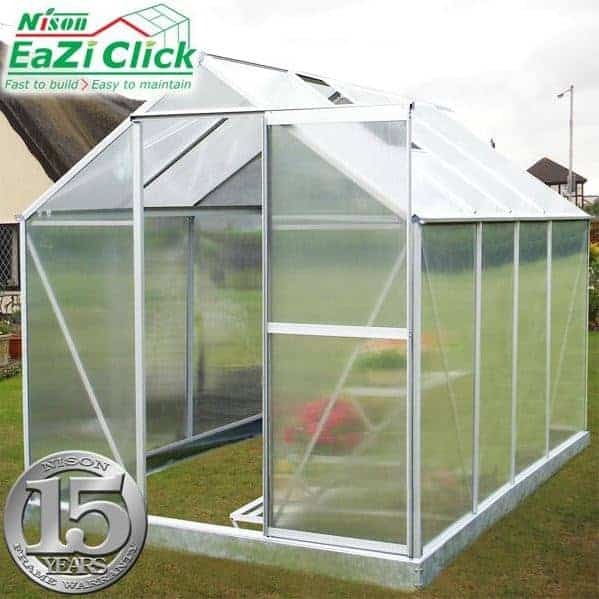 Final Thoughts: The 8' x 6' Nison EaZi-Click Polycarbonate Greenhouse is a fantastic greenhouse that is just the ideal size for gardens of all sizes. It's 8 x 6 size means that there is plenty of room to move around and to look after food and plants, but not at the expense of taking up the whole of your garden which is something we always like. We really love the way this is made and their EaZi-Click system certainly makes putting it together a breeze. The asking price for the quality and the size of this is very reasonable and if a new greenhouse is what you are in the market for then we highly recommend this one. Please can you advise where I can purchase eazi clips from. We are not sure we can help on this one.